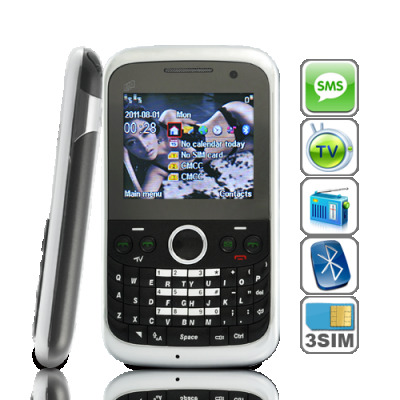 Successfully Added Triplexor - Triple SIM Quadband Cell Phone with QWERTY Keyboard to your Shopping Cart. Enter the Triplexor, a unique triple SIM Quadband mobile phone with the ultimate power of QWERTY. Let the Triplexor GSM Quadband Cell Phone keep your private number safe. With three SIM Card slots, this unlocked mobile phone is the ultimate business solution, and an ideal device for high end connectivity in the world of communication. Use 3 different numbers for 3 different purposes. Never has there been such an efficient phone for such a great price, with its great QWERTY keyboard, you can enjoy everything with the ease of a truly enjoyable interface. The main advantage of a QWERTY keyboard is to make it easier for you to compose and send emails, SMS, and search queries. Even if many users are satisfied with the virtual keyboard of most phones these days, we recommended that a real keyboard is much more comfortable particularly for business users. The QWERTY keyboard on a smart phone is easier to use and gives confidence and more tactile feedback, each key is isolated and curvaceous with a smooth feel to it. For Work calls: On call and accessible with one SIM card dedicated entirely for work purposes to keep your work efficient. Now you can have a separate number for your boss to call you, to have your assistant reach you, or to keep your mafia links in the loop with what’s going down. A dedicated work number also helps you maintain a professional image! For Personal Calls: Always reachable 24/7, you can have one SIM card just for your family and friends. It's also very convenient for the school to reach you and tell you that John burnt the school down or Mary was caught running a pirate DVD business. Perfect also for the wife to call you and tell you to stop by the drug store to pick up some incredibly useful things. You'll probably get most of your calls on this SIM channel. For example, Arnold’s wife might call and ask you for a secret rendezvous. Or Robert might call saying he met this really cute girl and she has a roommate so are you up for some midnight shenanigans? For Travel Purposes: Heading overseas to escape the law? Then make sure to keep an international pay-as-you-go SIM card ready and available! Making calls on your next trip can be easier and cheaper when you're prepared. For those who want more, the Triplexor Quadband Cell Phone also comes with solid array of amazing features, including: A camera and camcorder, video and music player, FM radio and e-book reader, analog TV, Bluetooth, full QWERTY keyboard, Flashlight LED, and much, much more. With the Triplexor, you'll have even more reasons to love your phone. As usual, Chinavasion brings you the latest gadgets from the world's factory (China) at an unbeatable wholesale price. To see this phone in action and make a killing as a drop shipper or a reseller, click "Add to Cart" right now, select your preferred shipping and in a few days, this amazing Quadband triple-SIM cellphone will be yours. And of course, it comes with our celebrated 12 month warranty and guaranteed customer satisfaction!